Deputy City Marshal Levi Neal was shot and killed while escorting a man to jail. He had arrested the man and while walking towards the jail the man pulled out a pistol from under his coat and shot Neal. Neal is the one of the early African American law enforcement officers to be killed in the line of duty in Texas. 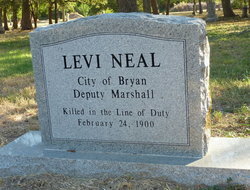 He had previously survived a shootout on May 15, 1885 that took the life of Bryan deputy city marshal Levin P. Smith, Jr. On December 2, 1888, Neal was with Bryan City Marshal M. M. Wilcox when he was killed attempting to serve a warrant. The 53-year-old subject who murdered him was sentenced to life in prison. He died in prison May 17, 1904. Neal had been in law enforcement for about 20 years. He was buried in an unmarked grave in the Bryan City Cemetery. His grave site could not be located but a marker commemorating his service was later erected. On today, the 117th anniversary of your death I would just like to say thank you for your service and sacrifice for the citizens of Bryan.